The periodic table is an arrangment of the chemical elements ordered by atomic number so that periodic properties of the elements (chemical periodicity) are made clear. There is no one single or best structure for the periodic table but by whatever consensus there is, the form used here is very useful and the most common. The periodic table is a masterpiece of organised chemical information and the evolution of chemistry's periodic table into the current form is an astonishing achievement. 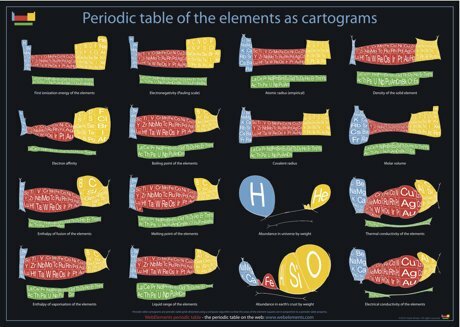 You can buy this periodic table poster and more at the WebElements periodic table shop. On 1 May 2014 a paper published in Phys. Rev. Lett by J. Khuyagbaatar and others states the superheavy element with atomic number Z = 117 (ununseptium) was produced as an evaporation residue in the 48Ca and 249Bk fusion reaction at the gas-filled recoil separator TASCA at GSI Darmstadt, Germany. The radioactive decay of evaporation residues and their α-decay products was studied using a detection setup that allows measurement of decays of single atomic nuclei with very short half-lives. Two decay chains comprising seven α-decays and a spontaneous fission each were identified and assigned to the isotope 294Uus (element 117) and its decay products. "WebElements, https://www.webelements.com (last accessed 18th April 2019)"